StageBuzz.com: FRIGID New York Interview - Bricken Sparacino of "Sisters Grimm: Fables of the Stage"
FRIGID New York Interview - Bricken Sparacino of "Sisters Grimm: Fables of the Stage"
Bricken Sparacino is an award winning/nominated performer, writer and director. She was one of nytheatre.com’s People of the Year ‘08. You might recognize Bricken from last year's FRIGID “audience choice award winner” Death: it happens. A girls guide to death. Other highlights include: the two person show, MEDICATION for the NYC Fringe Festival which was selected by BACKSTAGE as a highlight for the theatre season. She was nominated for Outstanding Supporting Actress in a Musical for her original character Cherry On Top (Planet Connections). Her first solo show, I’m Not Sure I Like the Way You Licked Me, was a great success. The Wonder Twin in Are We Freaks (Frigid Festival), Senior News Anchor in Weekly Review (Caroline’s Comedy Club), Natalie in Lenny Bruce Lives Inside My Shirt (NJ REP), The Crossing Guard in Respect the Vest (24 hour Play Fun), Bridgeet Lolalolalo in American Treacle (MITF). Bricken can be seen on the internet as part of the Key Of Awesome and AMCTV.com’s Sci-fi department. She is proud to be a part of the Frigid again this year representing in two shows! Sisters Grimm: Fables of the Stage, began at 24 hour play fun and she is very happy it has grown to be a play. You can see more of her directing in 36 Hours at the UNDER St. Marks Theater. Go to www.bricken.org to read more. Our show is a comedy with hints of bed room farce about theater and fairy tales. We make fun of the genre and auditions and actors and what happens backstage. 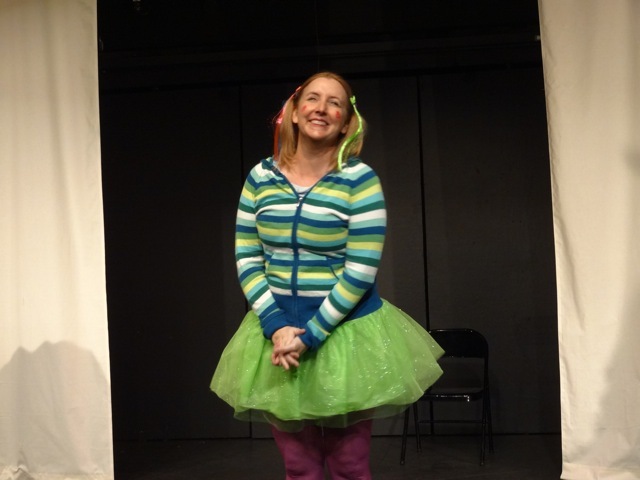 Amy E. Witting and I both had 10 minute shows about fairy tales and the life of actors. We created them for the 24 hour Play Fun. I always loved both shows. They thematically fit together, but were only 20 minutes together. I challenged myself to expand my section (Pointy the Starfish) and Sisters Grimm was born. 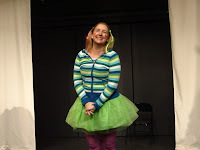 We pull inspiration from our own lives as performer/writers and I also take things from my day job working at the Central Park Zoo's touring children's theater company. We have a fantastic cast of 7 hilarious actors: Elisabeth Furtado, Brandon Schraml, Bill Bria, Derby Thomas, Adam Sullivan, Lori Kee and I'm in it too. We have two great composers we worked with to create the musical life of the show: Ethan Bailey and Eric Chercover. Elizabeth Chaney's Set Design and Starfish costume put the finishing touches to the production. Lori and I are co-directing, so someone is keeping an eye on both of us. People who love to laugh. The ladies of Absolutely Fabulous and real life. 36 Hours by Amy E. Witting, Two Lovely Black Eyes by Chris Harcum, My Box, written and performed by Killy Dwyer and The Spectator & The Blind Man by Dr ML Godin. I'm working with Gregory Levine for the Mini-Frigid in the summer. It will be a one-man show (mostly) about Gregor of Berlin. The play will be a tragicomedy, both with absurdly big laughs and heart-breaking poignance, arrogance and sorrow, as various segments come together to spin the tale of his journey from Berlin to Paris to NYC. Or something like that.